The Backyard provides a warm atmosphere with a comfort-food-focused menu. 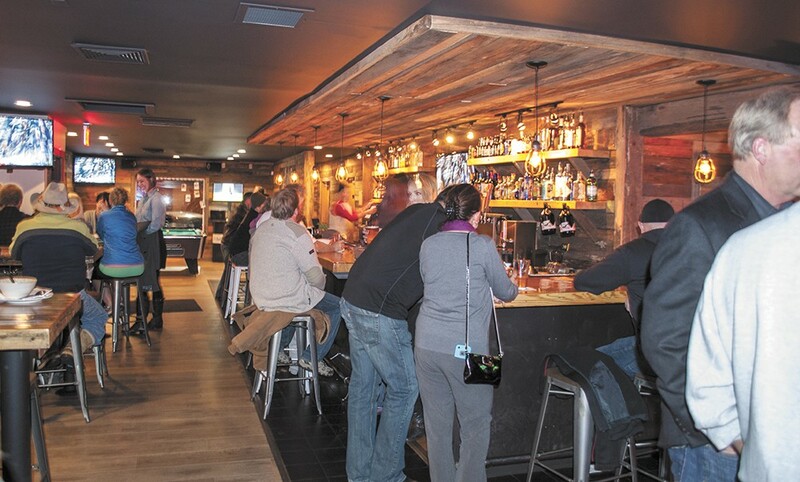 If you're a longtime West Central denizen who spent some nights in the Broadway Bar and Grill, you'll be pleased to know that the spot has reopened again as a bar. But you probably won't recognize a thing once you open the door. The former dive bar has been overhauled, both physically and gastronomically, into the Backyard Public House, a spot that exudes the feel of a neighborhood pub that serves the sort of creative (yet affordable) cuisine that might come as a surprise. With an interior featuring walls of reclaimed wood from Kettle Falls, high wooden tables and warm lighting, there's a comforting vibe that's easy to sink into. "We're a public house. I know people use that term a lot, but we're here for the neighborhood and the sort of people who like good food and craft beer," says Matt Goodwin, an owner or partner in several other Spokane restaurants, including Press on the South Hill and the Boiler Room craft pizza eatery in North Spokane. For this venture, Goodwin teamed up with former Press bartender Megan Warner, who serves as the Backyard's operating partner, running the bar's day-to-day, as well as Jordan and Whitney Tampien, who provided the real estate know-how to get the space ready for business. Goodwin says the biggest boon for the business was getting three chefs from the upper South Hill fine dining mainstay Luna to operate the kitchen. "We got really lucky to have all three of them on board," he says. Those chefs, Eric Biondi, Peter Rolando and Manuel Martinez, developed an eclectic menu that focuses on upscale takes on comfort food items like chicken and waffles, mac and cheese and an appetizer list consisting of pretzel sticks, street tacos, chorizo cheese sauce-covered nachos and more. The Backyard, currently a 21-and-up bar, sources food from neighborhood outlets like Indaba coffee, Alpine Bistro and Central Food, and Goodwin says they aim to be part of what's beginning to become a noticeable turnaround for that area of West Central. "We're trying to incorporate as much of the neighborhood as possible. We're committed to bringing up this neighborhood," says Goodwin. Come summer, the bar — named both for its location on the backside of Kendall Yards and its expansive rear area — will feature seating for 72 on its expansive patio, where you'll also find an outdoor bar and live music.